Tiruvilayadal Purana is reputed to be one of the 18 Thalapuranas. Yet, it is also revered as one of the Mahapuranas (Periyapurana - the right eye of God Shiva, Tiruvilayadal Purana - the left eye and Kanda Purana - the third eye). It was authored by Saint Paranjothi about 300 years ago. It narrates the 64 Tiruvilayadals (Leelas in Sanskrit) roughly translated into English as playful miracles of God himself - in this case, Lord Shiva the presiding deity of Madurai. It incorporates the legends and stories already prevalent in the Pandyan Kingdom in South India and covers a period of more than 500 years during the reign of 52 Pandya Kings and 6 other Kings. Lord Shiva and his consort Meenakshi guided, supported, punished, vindicated, blessed and finally gave salvation to the Kings and commoners alike in these 64 episodes. Many of these events find a mention in the earlier great Tamil works like Silappadhikararn, Kalladam, Thevaram, Tiruvasagam and some puranic poetry. While some of these episodes appear to be understandable and believable, many do not. One explanation for this is in that these episodes are the result of the fertile imagination of great devotees, mostly interesting stories narrated in a highly evolved poetic form by the great poet devotee. Another is that, this is basically a historical narrative of many Pandyan Kings who were all devotees of Lord Shiva described with some poetic license resulting in exaggeration and hyperbole. Another is that there is a mystic element present in these stories, which can be explained and interpreted only by enlightened persons. Yet another is that, these are moral stories built around a grain of truth; each episode teaches indirectly a moral for the humanity with the coating of a story. Whatever it may be, a large majority of us believe that God's ways are inexplicable and immutable and that we should enjoy reading about these happenings unfolding as poetic drama. But what about readers of today, who may not be well versed in Tamil? Surely, an English rendering, that too in prose form, will enlarge its readership resulting in this Purana being appreciated worldwide. Here is where my good friend Mr.Ponnuswamy - an eminent engineer turned Saivite Tamil Scholar - has come forward to fill the vacuum. After editing the Periya Purana in condensed English prose and publishing it, he is now bringing out the Tiruvilayadal Purana in simple English without missing any of the essentials. His efforts are praiseworthy and he deserves the gratitude of the Tamil and English reading public for this service. Mr. Ponnuswamy is 87 years old, bravely tolerating age related health problems. Yet, he has spent days and months reading this Purana and absorbing it, translating in English and putting it on the computer - all without any outside help. Amazing! 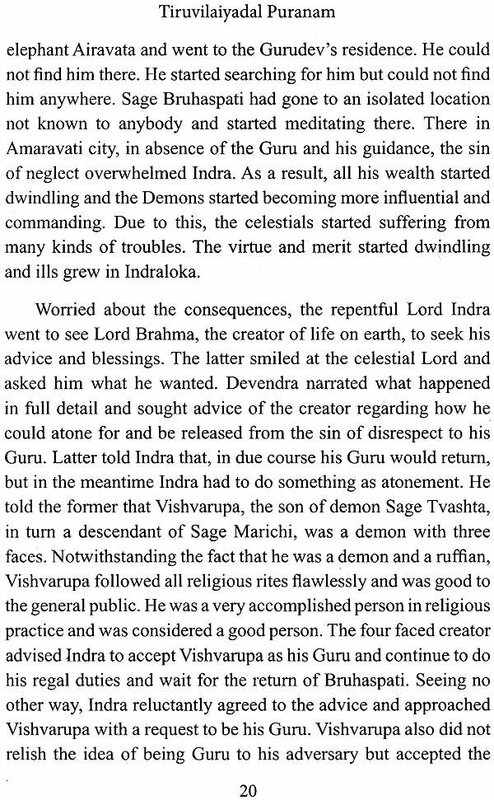 In this context, I am reminded of what Lord Shiva told to Saint Manickkavasagar (Author of Tiruvasagam) asking for salvation. According to Tiruvilayadal Purana, Shiva said "there is some work yet to be done by you; hence please be here for some more time". What a blessing! The Lord's blessings, Mr. Ponnuswamy will have a healthy and active life for many more years to translate and edit the other great Tamil classics into English to suit today's lay reader. I ani deeply grateful to my friend Mr. Ponnuswamy for having given me the honour to write this preface. Tiruvilayadal Purana is an Epic describing the sixty four divine games played by Lord Shiva, who had taken abode in Madurai since time immemorial as Lord Somasundarar. He had done these episodes to show His concern of-all lives. The incidents relate to what He did for the welfare and corrective measures to the lives varying from a Blackbird to as high a person like Indra, who had shown their devotion to the Lord and / or came to Him seeking pardon from Him for its, his or her mis-deeds. According to the legend, narration about these was made by the Lord Himself to his Consort Parvati at Kailash, when their son Lord Muruga/ Subrahmanya was sitting on his lap. Lord Muruga later recited these to diminutive Sage Agastya, who in turn narrated these once at Kashi. They are stated to form Alasiya Manmiyam. (Tiruvalavai Samhita, a part of Skanda Purana, one of the eighteen Hindu Puranas which were recorded by Sage Vyasa and later repeated to other sages). The stories have many versions, sung by many Tamil Poets. This version, narrated here, is based on the original verses of Sage Paranjothiyar, who did this for the benefit of the community at the request of many of his followers and learned people of Madurai (as recorded by him in the 25th verse). It is said that he commenced the work mainly on a command received from Mother Meenakshi of Madurai in one of his dreams when he was staying at Madurai. Skanda Purana is the thirteenth of the eighteen Puranas which, according to some historians date back to the third to tenth centuries CE. The ancient nature of the Pandya land had been brought out in some other Puranas also, where it is said that sage Narada had once mentioned after an aerial trip of his to the South of this land. The famous early Sangam literature Paripadal had devoted about one third of itself for describing the way in which people in Madurai enjoyed in the River Vaigai. 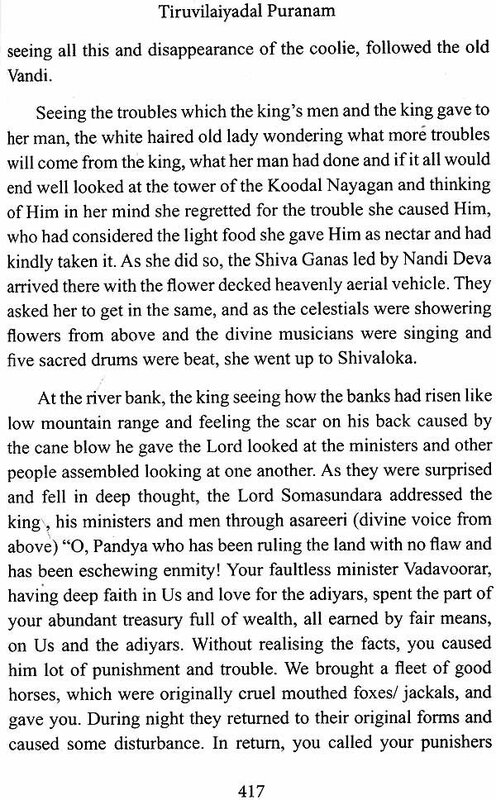 Silappadhigaram, another literature dating back to third century CE contains narration about three of the Tiruvilayadals (Lord Shiva dancing in the Silver Assembly hall at request of two saints, about Vikrama Pandyan throwing the Spear given to him by the Lord at the sea to dry it up and his throwing a flower discuss over Indra's crown and dislodging it. 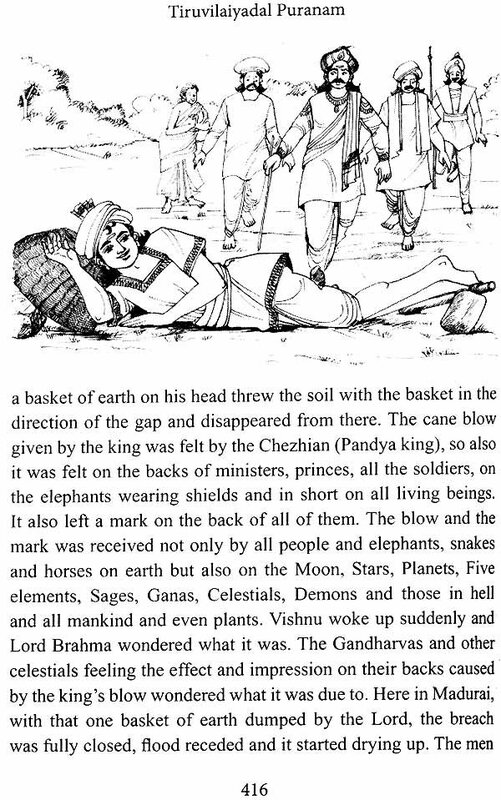 Kalladam (10th century) contains description of some 21 of these incidents. Many of the later incidents form part of padigams of the three Tevara saints and in Tiruvasagam of Manickkavasagar who lived much later. There are a few more later poetic literature specially written to cover the Tiruvilayadals like Tiruvalavudayar Tiruvilayadal Puranam (of Chellinagar Nambi), Sundara Pandyan, Old Tiruvilayadal, Kadamba vana Purana, Sundara Pandyan etc .. Of these, only the Tiruvalavudayar Tiruvilayadal of Nambi covers sixty four divine games, as also the last in the series is the one written by Paranjothiyar, mentioned above. But the former is only about half the size of that of Paranjothiyar. There are some differences between the two in the contents and their sequencing also. While Nambi mentions only the names of Pandya kings who ruled during the occurrence of the incidents, Paranjothiyar has tried to establish some historic authenticity to the incidents by listing out all the Pandyan kings who ruled the land during the entire period of all incidents. 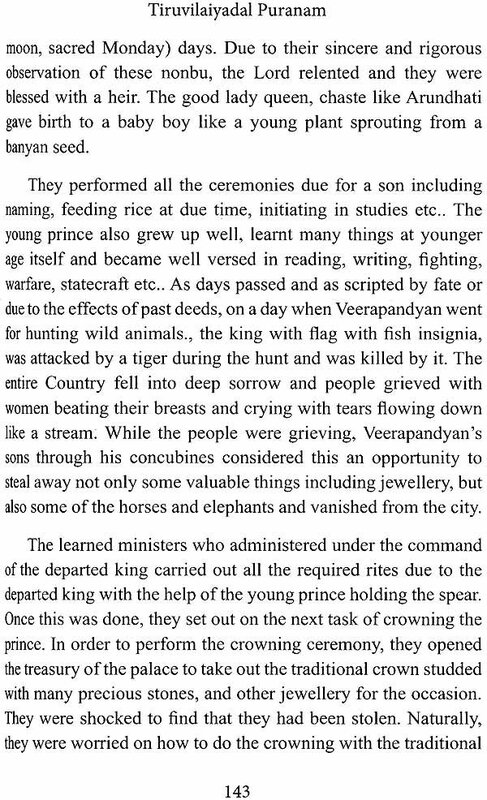 In sequencing of the events, later research showed some discrepancies in these works, which is natural in such a narration [Source: Tiruvilayadal Purana by Paranjothi Munivar- Vol 1 of N.M. Venkataswamy Nattar]. These show how the Tamils have been emotionally attached to Shaivism and Shiva, to the extent of believing that it was Shiva who created the Tamil language and taught it to Agastya (and established the ancient Tamil Sangam- dating to about 2000 years back), as he taught Sanskrit to Sage Panini. He also ruled the land as Somasundara Pandyar after marrying their princess Tadadagai Pirattiyar (Meenakshi). Paranjothi Munivar, the author of this epic was born in a staunch Shaiva (known as Abhidekathars) family to a well learned Shiva devotee Meenakshi Sundara Deshikar at Tirumaraikkadu a sacred village in the then Chola Nadu about 300 years back (sixteenth century according to World Press.com). He showed his brightness and love for the faith and Lord Shiva from his early childhood. He took his Deeksha in the traditional manner from his own father in his early childhood itself. He learnt both Tamil and Sanskrit languages and studied a number of and rare books and became quite learned and familiar in both languages. His father taught him the Shivagamas, Thevaram, Tiruvasagam and also Bharatam. He took lessons in music and became an expert singer too. He was so devoted that he used to experience 'bliss through japa, tapa, dhyana and yoga. He used to go on teertha yathra to many Shiva shrines, where he used to sing the praise of the Lord and Mother Uma in 'flawless Tamil Verses'. And during one of these travels, he reached Madurail Tiru Alavai where, after a dharshan of the presiding deities Somasundarar and Angayarkanni (Mother Meenakshi), he went into ecstasies. 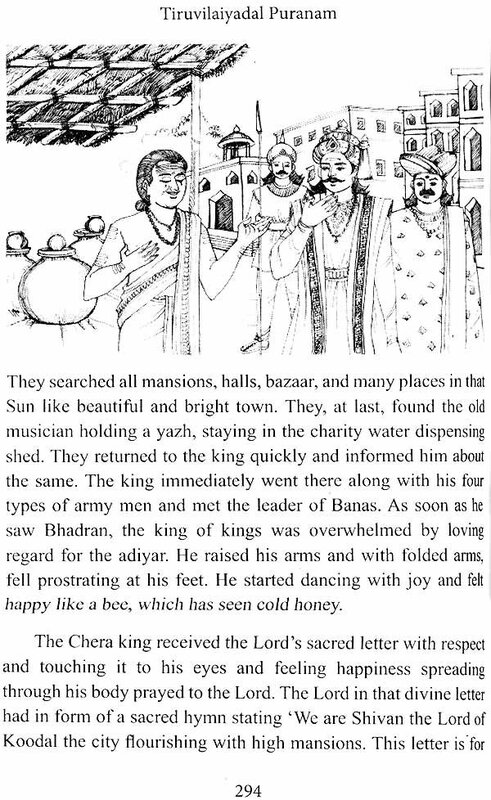 He received such bliss in worshipping them that he decided to stay on in that city itself. It is said, during one of his visits to the temple that Shiva presented Himself to him as a Shiva Yogi (Siddha) and . being honoured by the devotee, He not only blessed him but also gave him Deeksha and Jnyanopadesam. 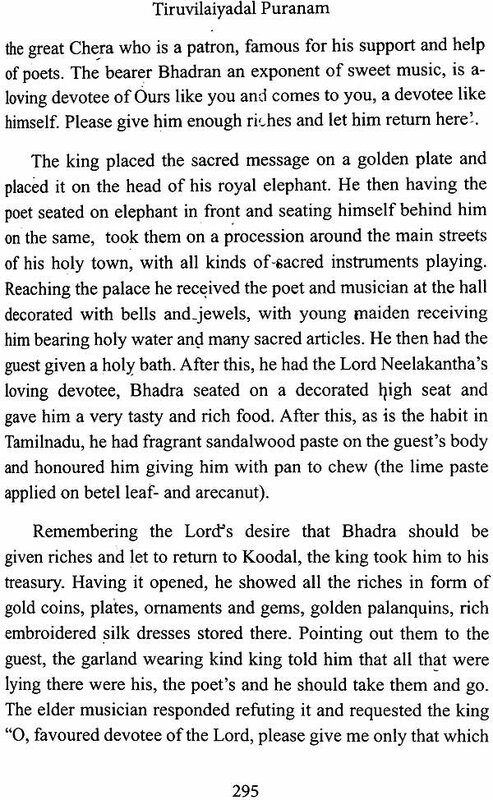 When people of the town came to know of his presence, they all thronged to hear his talks and songs and some of the learned persons asked him to render the Lord's various Tiruvilayadals in Tamil The Munivar soon thereafter took up the task, staying in Madurai itself. This period coincided with the time when Tirumalai Naicker hall, the famous palace was being built at Madurai. On completion of the Purana, the Munivar sought the assembly of the learned people there and presented his work, Arangetram, in the Thousand Pillared Hall inside the temple. He was highly honoured by the king and people of the town for same. It has proved to be a book of famous literature in Tamil after Sekkizhar's Periya Purana (written in Chidambaram under the patronage of the Chola King in the 12th Century).